Stopwatch item An item box designed to stop time? Its use is unclear, however it may have assisted E-102's time-limited levels. Chao emoticons These would have appeared over the Chao's head but do not appear in normal gameplay. Found in AL_ICON.PRS. Tornado life gauge graphics The red "Tornado" life gauge is used in both Sky Chase Act 1 and Sky Chase Act 2. The Tornado 2 has its own blue gauge on the disc, but the graphics are never used. Found in ST_128S_HPGEJI.PVR. Sonic Jam spring model Sonic Adventure was built on the engine seen in the Sonic World section of Sonic Jam, but this is the only Sonic Jam asset to be found on the Dreamcast disc. Its texture is also otherwise unused - other objects (Springs etc.) use a different, more detailed version instead. 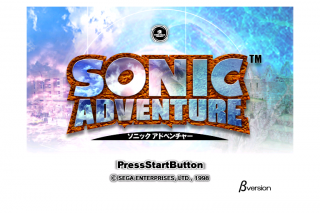 Found in TITLE.PRS, it appears a specifically-labelled "beta" version of Sonic Adventure existed at one point. A build of Sonic Adventure was available to play at Tokyo Game Show '98 Autumn. Japanese instructions on how to play the game remain in most versions of the game. Also found on the disc are six images which make up an older character select screen. Incidentally, "Choose Your Buddy" is also the name of the song used on the character selection screen. These screens were likely shown at the aforementioned Tokyo Game Show, but potentially other builds as well. Found in C_SELECT1.PRS and C_SELECT2.PRS. This prototype loading graphic is used in AutoDemo, but not in the final game. Found in LOADING.PRS. 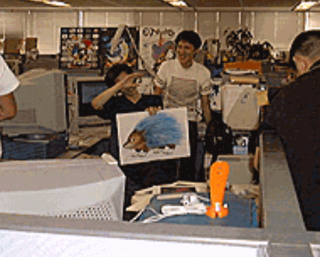 Sonic Team took plenty of photos of the Sonic Adventure development process. Many of these are included on the original Japanese version's disc for the website, but in the western release only two remain - "DRAMA0" and "DRAMA1". Through digging, several unused Tikal voice clips were found inside the game. Tikal talks about Super Sonic (info) (370 kB) - This indicates that Super Sonic was meant to be usable in regular levels. It is also possible that the player was once required to manually collect the Chaos Emeralds before the Perfect Chaos boss, and this voice clip explained what to do afterwards. There are also several clips that can be found that discuss the Chao Gardens, some of which include information inconsistent with how the final game works ("Don't put more than six Chao in a garden" and its variations, for example). A Japanese level list was discovered in the PC version of Sonic Adventure DX, and later in regular Sonic Adventure. This list contains names for three levels that do not exist in the final version: "Mushrooms" (きのこ), "Jungle" (ジャングル) and "Desert" (砂漠). 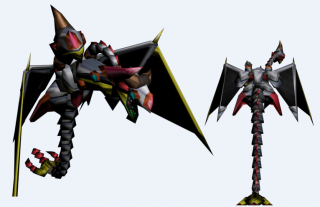 One of the more curious absentees in Sonic Adventure is a giant two-headded dragon once set to appear in Sky Chase Act 2. It features in development screenshots and was briefly seen at the Tokyo International Forum unveiling, but is missing in the final game. 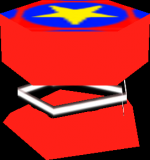 The object does exist (having originally been found in Sonic Adventure DX: Director's Cut (preview)), but the polygons are not linked up properly in the final build. The first image shows what was found, the second image shows how he should look when properly assembled, textured, and colored, and the third image shows how he looks in game in the Dreamcast version, placed by hacking the game's SET files. 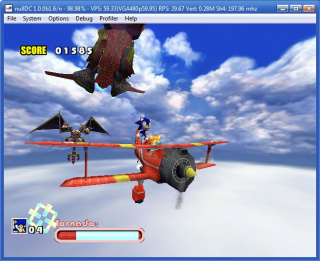 The dragon continues to exist in Sonic Adventure DX. The Dr. Eggman and Tikal objects used in cutscenes are actually programmed the same way as the playable characters, and can be played as with hacking. They both have only the most basic movement functions, walking and jumping. They can't hurt or get hurt by enemies and obstacles, and cannot run on wind paths and some loops. Pressing the action button activates the free movement mode which is normally only active when debug is on. Dying before hitting a checkpoint or changing segments in an Action Stage causes the game to crash, as they do not have starting position lists. Alternatively, when using a moon jump cheat code during a Tikal flashback, Tikal will jump as well. A small hidden corridor can be accessed behind the door pictured in the above image. 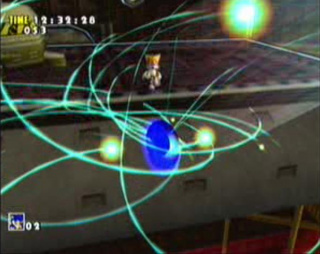 To reach it, the player needs to start a Spin Dash on the edge of the bridge facing it. At the bottom of the corridor the camera stops, so the player has to rely on the first person camera to look at the surrounding environment. At the end is a dead end where the player cannot return. If a glitch is used to get Knuckles into Sonic's Final Egg, Knuckles can also access this area if done correctly. This was planned to be used as a transition to the area Sonic's scene with the Egg Viper takes place in, being the original location of the goal. The goal was eventually moved back and the map was no longer needed, so the area was covered up. The camera for this transition is still intact and can be seen if the player walks up to the covered entrance. 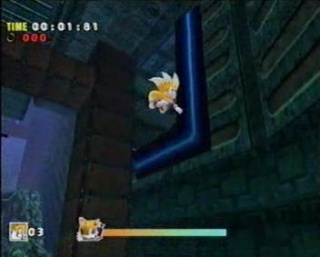 In the ceiling above this area and behind the striped object, Tails can fly to a unused corridor. When flying out, a strip of land will become visible. When Tails lands on it, he will go through the ceiling. This hidden part of the level seems to be fairly complete as there are monitors and rings. 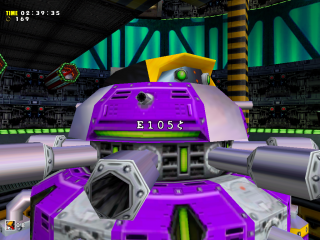 Some textures used for E-105 are actually Dreamcasts. This potentially provocative cowgirl billboard from Casinopolis is only used in the Japanese version of the game, being removed for unknown reasons in Western releases, Sonic Adventure International and Sonic Adventure DX. Note: Can we get some screenshots? Far below Speed Highway Act 1 you can find a bunch of helicopters and a capsule, applying the object layout to Act 2 will reveal a early layout. Even though Sonic doesn't go through Twinkle Park Act 3 he has a layout for it which is actually very old as the wrong objects show up. Sonic also has a layout for Hot Shelter even though he also doesn't goto the stage and it's also very old. As Big by using no clip mode you can get to the island used for his cutscene but even going even further reveals leftover objects from Sonic's level. Interestingly this seems to match the layout of the AutoDemo. These were removed in SADX. This page was last edited on 6 April 2019, at 15:54.